“Luan ap Garioch, second son of the house of Artran, this is the day of choosing. How do you choose?" On the last day of the summer of his fourteenth year, Luan takes the first step on The Path of Swords. He has been told that the path will be hard. He knows that it will lead him into danger. The reality is beyond all his imagining. 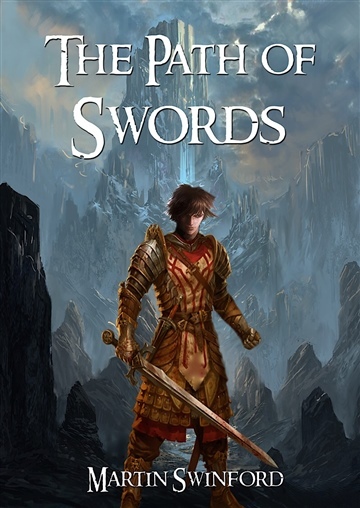 Described as "Wonderfully imagined" and "skilfully crafted", The Path of Swords is the first novella in the Song of Amhar fantasy series. Set in an alternate Iron Age where the world of the spirit is always close by, the series follows the adventures of Luan, a boy training to become one of the Klaideem, elite warriors who dedicate their life to the service of the kingdom. Deep in the heart of Lincolnshire, in a dusty attic room at the very top of a crumbling mansion, Martin Swinford crouches over his keyboard and waits. He waits for the words. The words that he knows are there. The words that will flood his mind if he waits long enough. The words that will slip elusively from his grasp as he stretches to catch them. Later, he thinks, he shall go down, and stroll the long gallery under the watchful gaze of his ancestors. Perhaps he will sit in the library, absorbing the collective knowledge of the mildew blackened books. Perhaps he will have a drink, anticipated by the melodious sound of the clinking glass as Crevice shuffles along the servant's passage. Perhaps even a cigar, one of the rare local specials, hand rolled on the expansive thighs of the village bar-maid.He extends a finger and taps out a single word: "Perhaps." Martin Swinford writes, paints, reads and walks the dog, but not necessarily all at once. He lives in Lincolnshire, England with his family who work tirelessly to keep him from getting too weird. In the time that’s left he teaches Psychology and Mathematics. His biggest fear is getting bored.Martin is the author of The Song Of Amhar Series, consisting of The Path of Swords, The Guild Of Warriors and The Arena of Lost Souls and is currently working on an untitled fourth book. He has recently completed a Science Fiction novel, Thus Falls the Shadow, which is due to be released in October 2018. “I felt at times that I was walking old school through Middlearth with Strider..."
"A sprightly tale...totally enchanted me"
"So action packed I literally couldn't put it down!"